It is easy to wear with a light set, and the artificial wool insole is very comfortable. 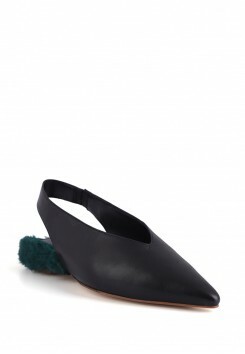 Mules's enthusiasm has not diminished, spreading to 2019, becoming a must-have fashion item. Mules is designed to expose more of the foot and visually lengthen the proportions of the legs. Upper: KidLining: Fruax furOutsole: RubberHeel Height: 1cm- 2019 Hot SlingbackThe Slingback design r..
Upper: Kid Lining: Fruax fur Outsole: Rubber Heel Height: 1cm - 2019 Hot Slingback The Slingb..